Total Soccer: Road to Glory - All the Drama of 90 Minutes in 90 Seconds! 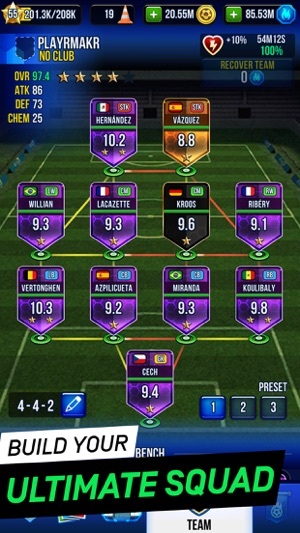 Real Players, Real Ratings based on Real Form! Play with over 850 players from the world's best leagues! 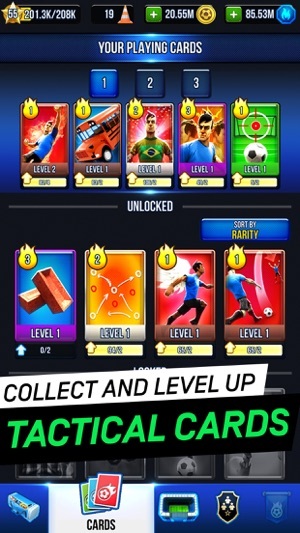 Build your ultimate soccer team in Total Soccer! Play tactical cards during games to lead your team to victory while earning promotion and fighting relegation. 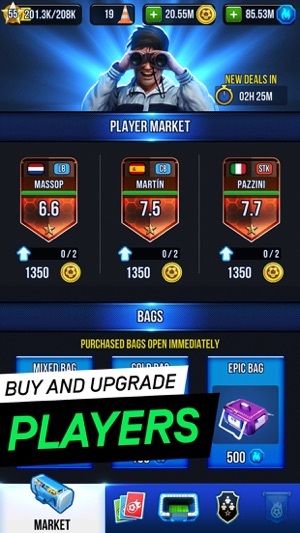 Open packs of players or purchase them through direct transfers and auctions. Collect, upgrade, and play tactical cards during matches to help your team win! 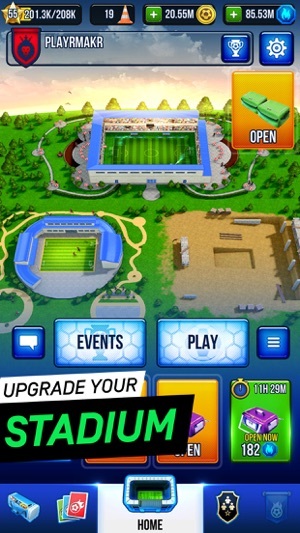 • Compete in weekly events against some of your favorite YouTubers and professional footballers to earn great prizes! Have issues with the game or want to help us improve your experience? Our support team is always available. Send us a message on Facebook within the game or contact us at info@playrmakr.com! I think the idea for this game is brilliant. And it is a ton of fun to play!!! I’ve played through several leagues and topped everyone except one which I’m quite happy about. There are a bunch of bugs though which can be frustrating. The presets for teams aren’t working, and it doesn’t always register when stamina is taken away from my players which means they could start the next game low and then I’d loose which is frustrating. I have also noticed that the super star card can cause some problems. Such as my player will just freeze with the ball and no one will step to him and it is just stuck the rest of the math. The tackle animations work only about 50/50 as well. I also think a good feature to have would be to show what exactly improves when upgrading one of the power cards. Other than that this game is incredibly fun and I love playing it! Once it gets ironing out, polishing, and expanding this game will definitely be incredible. It’s a great blend of ultimate team and Clash Royale. I can’t wait to see what comes next! Hey GidgetCat! Thank you so much for the awesome feedback! We really appreciate it! Would you mind shooting us a note at "info@playrmakr.com" and we can better help sort some of your issues out? We are working on our next update now, so would love to hear more of your thoughts. Thanks again! Game is better than I thought it’d be and I’m still enjoying it despite its problems. Sometimes, my team scores, play resets and the score changes, but it all happens without the time and player who scored’s name popping up. I’ve noticed that whenever this happens, the goal doesn’t get counted. Luckily, most times, I’m up by more than one, but I have had it when a goal not counting has cost me the win. Also, the preset feature rarely works, and sometimes, when I move players around, there’s some sort of error and I have to try again. Additionally, I’d love if there were some way to delete bags. With only 4 slots and bags taking 3, 8, and 12 hours, I often have all slots full with bronze bags and I’m unable to potentially get a silver or gold one. Furthermore, I won’t comment on the player ratings, but lots of info on what team they play for is outdated, and some players have the wrong nationality. Like, they were born in and played for a different country. Hi Pancotta! Thanks so much for checking out the game and for the review! We really appreciate it! Would you mind shooting us a message at info@playrmakr.com and we can chat there? Would love to hear what you are enjoying about the game and more importantly, what is annoying you about it so we can get some things resolved and improved! This game is actually a pretty fun managerial-type game. I love being able to get a free pack after each game that will eventually give me players I can use/sell. It makes it a lot easier to buy better players from the store to upgrade my team. 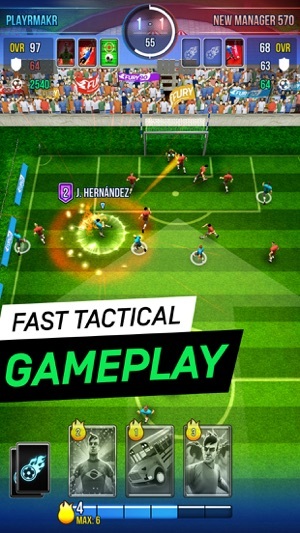 This game reminds me a lot of FIFA Ultimate Team, but a more fast-paced and directly influenced game-play. Overall, I really enjoy this game! The only critique I have is with the clubs. For whatever reason the club I created does not show me on the roster. It also defaults my club location to Croatia even though I’m in the USA. If these issues could be fixed I’d have no problem recruiting other players to my club since I’m currently ranked 37th globally, and have more points than most clubs anyways.